On the Richard & judy show (in the UK), shown yesterday (25th June), there was an interview with Captain Ray Bowyer. Also from The Guernsey press , an article about him being on “Richard and Judy” (dated 26th june, This is guernsey). Someone has very kindly posted it on you tube and it can be seen below….lasts around 6 mins. There are some more links to be added…. (thanks to www.uk-org/ufologyinuk as i had missed these). A map of the general area , casquets lighthouse, which Captain Bowyer mentions and an attemp to place the sightings on a map (very useful). Also the only Guernsey ufo photo at you tube…although i am not conviced by this whatsoever…..but here it is, for you too decide. 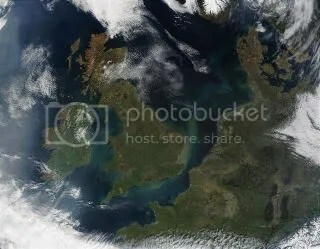 It is also worth pointing out (also highlighted by www.uk-org/ufologyinuk ) that nearby these sightings, are La Hague nuclear reprocessing centre, and north of Alderney, the Hurd deep inventary (was used for nuclear waste disposal, ie plutonium)….this in itself should be cause for concern to the authorities…if nothing else, due to the earthquake that was felt in Kent recently, among other things. Also, i can add that proper information analysis is being carried out by several researchers and scientists, at this moment in time (both British and French, ie French government UFO agency GEIPAN will be involved, to what extent i am uncertain)….. and a thorough investigation will take place with the co-operation of Captain Bowyer’s. I know this will be done down to the smallest details, with everything considered… and therefore this may take some time in creating. But i will post on this blog any new information…. Jellyfish-shaped ‘UFO’ spotted in Shanghai by — SEVERAL people reported seeing a jellyfish-shaped unidentified flying object about 8pm in Shanghai on Monday. 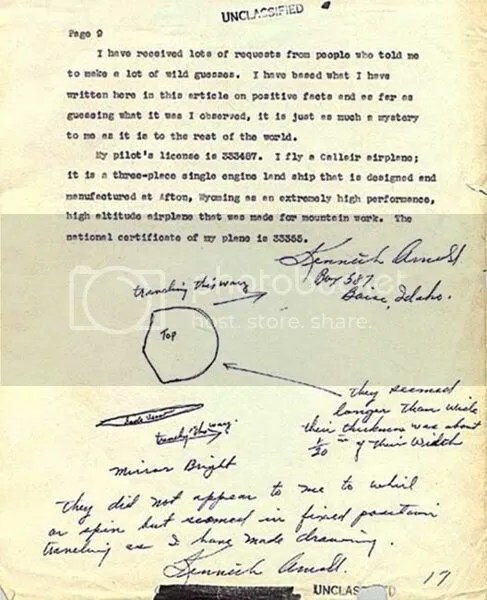 On the 24th June, 1947 (60 years ago) Kenneth Arnold (1915-1984), an American businessman, saw an extra ordinary event, which was to create the phrase/term “flying saucer” or “Flying disk” by the press. (for early newspaper articles on this see link here). He was flying from Chehalis (Washington) to Yakima (washington), in a Call Air A-2 due to a business trip, when he found out that a $5000 reward was being offered for the sighting of a US marine Corps C-46 transport plane, which had crashed near Mount Rainier, and so went to find it…. By 3pm he gave up the search and started to travel to Yakima, when he saw 9 objects (flying in a chain) flying over Rainier to mount adams (he later calculated they must have been travelling 1200 mph- ie time travelled between the 2 points). The media were soon onto this, as word got around, and Kenneth later said that they “flew like a saucer would if you skipped it across water”…. this soon led to the term by the press of “flying saucer” and also “flying disk”. A excellent article can be seen written by Arnold himself, about the event at Project 1947 . A very detailed analysis can be found here and there is a transcript of a telephone conversation with kenneth here . 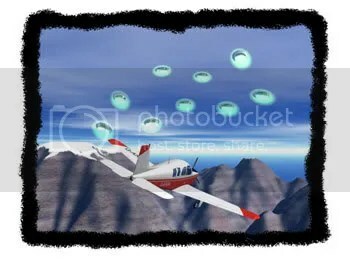 Sky news have now picked up the story of the channel island ufo’s, (23rd April, 2007 -on this site under channel island incident- 3 articles) and the link for Sky can be seen here . On the right, (in the sky article) is a video of Nick Pope identifying possible ufo’s on sky news … i will leave you to decide on his take on this. I have also spotted a link to this at This is London.co.uk(article also done recently) and also Fox news. Ministry of Defence in 1998 – 2006, has recently been added to their website……please see here . Also, unrelated to the above, but of some interest………….The Wired blog network has an article on Spooks Infiltrating UFO Community….mmm. Lets hope i do not get whisked away, on the grounds of National Security…. According to HELSINGIN SANOMAT (International Edition), a Ufo Finnish Research Association, published infrared video images of UFO’s, on their webpages and in their magazine….. it is mentioned that this is an official Authority video. The authorities are to investigate this, as they have no knowledge of issuing anything to the press. For more information see here . Update: 25th june 2007…………..The direct link to this can be found here. I was made aware of a Video on google (recently put on there) which is worth having a look at….about Mexican ufo’s at a UFO conference. It starts off with the Mexican Air Force encounter …. most interesting. The video lasts just over 1 hour. An interesting (if fairly spooky) article to get us started is at wired , about Plasma laser’s and whether they have contributed to UFO sightings (and whether they exist). The Daily Courier.com mentions, why the Kecksburg incident continues to intrigue (event happened 1965). The Roswell theme park is, according to United Press International (original source: the washington times), surrounded in secrecy …. AUFORN (Australian UFO Research Network), has a very interesting website, with an on-air feature coming soon too… also books,ect and updates of ufo sightings from down under.